Hi, sorry for all the Asian food but it's so delicious. You understand, right? These are one of my favorite foods, but we don't have them that often because you know, I'm lazy. Really, you can fill these with whatever you want. Vegetables, leftover sliced steak, chicken, whatever. Slice up the shitakes and cook them for about 5 minutes in the sesame oil. Bring a kettle of water to boil, then pour over the bean thread noodles. Swirl the noodles around until they're soft, drain, then run under cool water. Use scissors to cut the noodles to manageable chunks, if you need to. Assemble all your ingredients. Fill a shallow, wide bowl with warm water, making sure it's large enough for your spring roll wrappers. One at a time, float a wrapper in the water until it softens, then place on your work surface. Place a bit of each component in the center of the wrapper, then fold up like a burrito (sorry, I was too involved to take action shots. Internet how-to here), then fold the edges in, pull tight, and roll over the top. Set aside and start over, repeating until all your fillings are gone. Serve with peanut sauce, below. Dump everything in the blender, and puree until smooth. If you want it to be warm, stick it in the microwave for 15 seconds or so. Jill! These are my favorite. And I love you. I understand, totally. 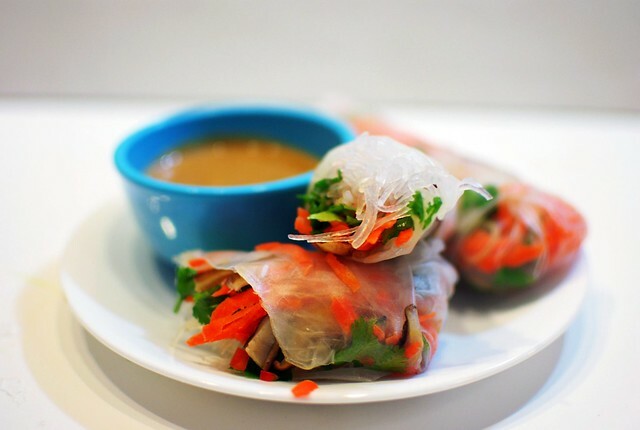 I love summer rolls but they always seem like such a big deal to make! I love love love summer rolls. Yum. Now this is what I want for lunch. Send me some?